Power Factor Correction can provide significant savings as an Energy Conservation Measure. Is your facility's Power Factor a part of the utility bill that you'd like to improve? If your company is using electrical power inefficiently, chances are good you’re paying more for electricity than you’d have to. The best way to determine electrical efficiency is to take a look at power factor. Power factor is the ratio of working power (the electricity needed to do useful things, e.g., run equipment) to apparent power (the electricity your utility must supply in order to deliver the working power you require). 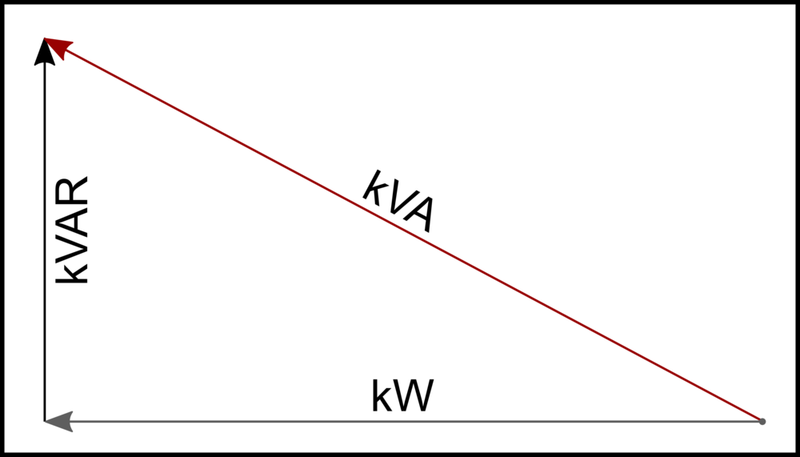 Working power is measured in kW; apparent power, in kVA. Ideally, these values are equal: one unit of apparent power provides one unit of working power (1:1). But another type of electrical energy--reactive power (kVAR)--counteracts working power, causing it to be used less efficiently. As a result, the utility must supply more apparent power in order to deliver the working power required for operations. In an efficient electrical system, kVAR is low, and KW and KVA are in a near 1:1 ratio. The more kVAR in the system, the greater the ratio between working and apparent power (.95:1, .85:1, etc.) --and the poorer the power factor! In a system with high kVAR, the Utility must supply more kVA in order to deliver the kW level the customer needs for operations. The need for larger cables and higher-capacity equipment than would otherwise be necessary. Voltage drops that shorten equipment service life. Reduced electrical system service capacity. Over the past 20-plus years, solving tough power factor correction (PFC) problems has been a staple in D.L. Steiner’s service offering. Our solutions have ranged from the traditional (application-specific PFC capacitor banks) to the creative (using clients’ synchronous motors to assist with PFC). We have a long record of PFC success--and all the expertise that comes with this experience. If you’re struggling with poor power factor (.95:1 or lower), D.L. Steiner is ready to help. We’ll analyze your situation, pinpoint the causes, and then design a PFC solution that will improve the efficiency and reduce the operating costs of your electrical system.